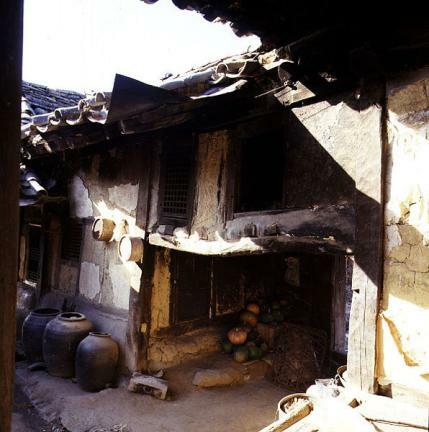 1800년경 학암 김중휴(1797∼1863)가 분가할 때 지은 집이다. 'ㅁ'자형 집이며 중문을 기준으로 안채와 사랑채가 나뉘어 있는 독특한 건물이다. 원래는 중문 밖에 사랑채, 행랑채, 초당이 있었으나 현재는 그 자리만 남아있다. 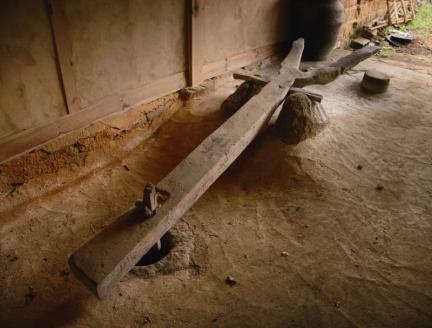 참봉댁이라 한 것은 김중휴가 제능참봉을 지냈기 때문이라고 한다. 동네 어귀를 돌아들면 약간 경사진 곳에 토담을 두르고 행랑채에 솟을대문이 있다. 넓은 마당을 사이에 두고 안채가 있고 그 오른쪽에 곳간채가 있으며, 마당의 동쪽에 사랑채가 있다. 안마당으로 통하는 중문간의 왼쪽에는 사랑방이 있고 오른쪽에는 마구간과 부엌방이 있다. 안채는 안마당과 폭이 같은 대청을 중심으로 왼쪽에 건넌방, 오른쪽에 안방이 있고 안채의 오른쪽에는 곳간채 4칸을 나란히 놓았다. 사랑채는 전면 툇마루 뒤에 온돌방과 개방된 마루 1칸이 'ㄱ'자형을 이루고 있다. 행랑채는 원래 5칸인데 대문간 오른쪽 2칸은 주춧돌만 남아있고, 왼쪽 2칸은 온돌방으로 되어있다. 안동지방에서 흔히 볼 수 있는 유형의 집으로 조선 후기 주택연구에 좋은 자료가 된다. 지정 당시에는 '오미동 참봉댁(五美洞 參奉宅)'이었으나, 현행 문화재 명칭상의 "오미동 참봉"이 관직명으로 오인되고 있으므로 이를 바로잡을 필요가 있다고 생각되어, 지명과 건축주인 학암 김중효의 호를 병기하여 '안동 학암고택(安東 鶴巖古宅)'으로 명칭 변경(2009.12.21)을 하였다. 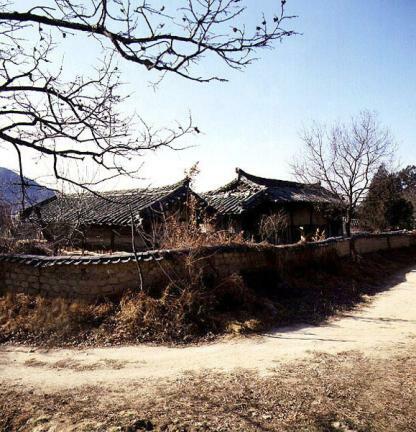 This house was built by Kim Jung-hyu (pen-name: Hagam, 1797-1863) around 1800. 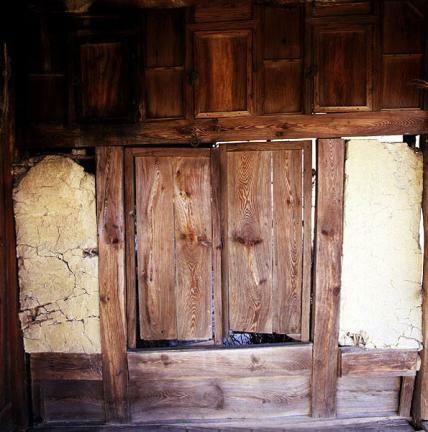 It has a unique structure built in the “□”-shaped layout with a middle gate, which divides into anchae (women’s quarters) and sarangchae (men’s quarters). 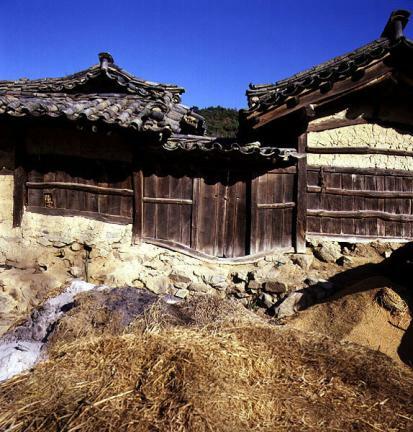 Outside the middle gate, there used to be sarangchae, haengnangchae (servants’ quarters), and thatched cottage; currently, however, only the site remains. 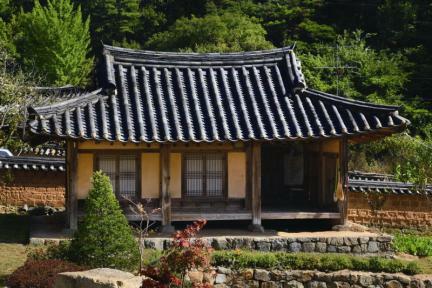 This house was called Chambongdaek House (Chambong means government post) because Kim Jung-hyu was appointed to Jeneung Chambong. 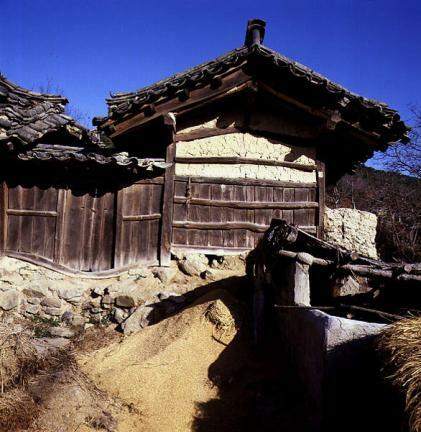 This house is situated on a sloping land surrounded by earthen walls, with a tall gate at the haengnangchae. 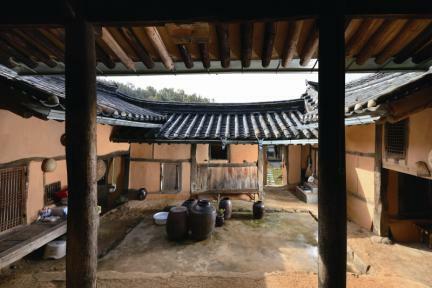 Centering on a wide courtyard are the anchae, a barn on the right, and the sarangchae on the east side of the courtyard. 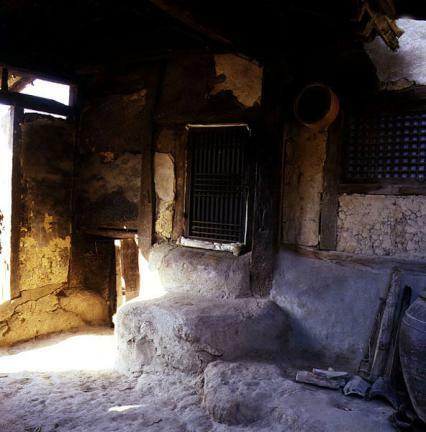 The sarangbang (master’s room) is on the left side of the middle gate that leads to the courtyard of the anchae, with a stable and a kitchen room on the right side. 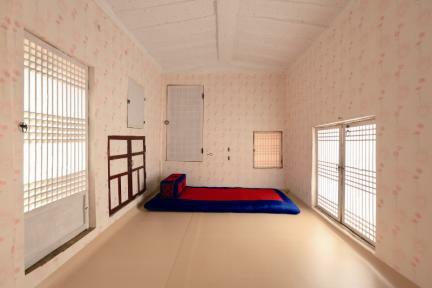 Centering on the daecheong (main wooden floor), the anchae has the anbang (main room) on the right and a room across from the anbang. 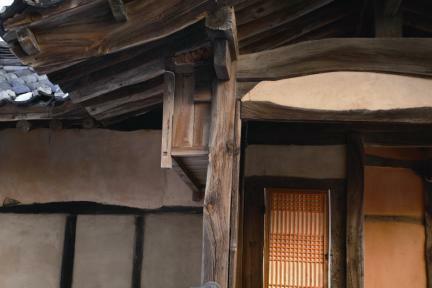 On the right side of the anchae is a 4-kan (a unit of measurement referring to the distance between two columns) barn. 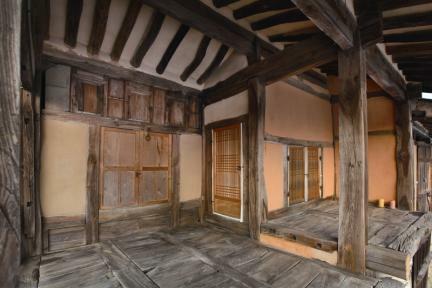 The sarangchae was built in the “ㄱ”-shaped layout with toenmaru (wood-floored veranda) in the front and a floor-heated room and a 1-kan wood-floored area at the back. 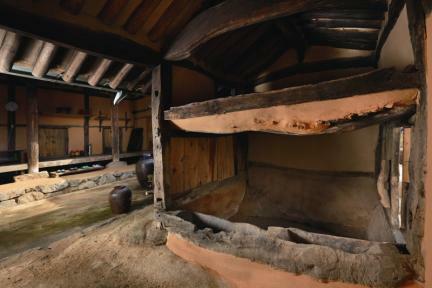 The haengnangchae used to be a 5-kan space; currently, however, the 2-kan space on the right has only a cornerstone remaining, with the 2-kan space on the left built as a floor-heated room. 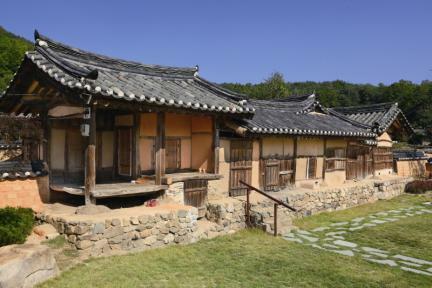 This house was built in a typical structure found in the Andong area, providing valuable information in studying the housing of the late Joseon Dynasty. 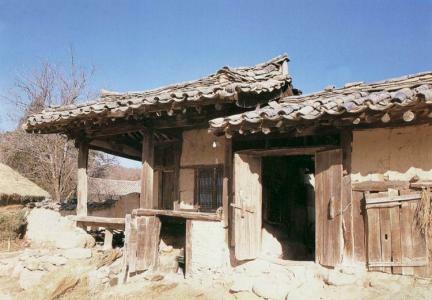 This house used to be called “Chambongdaek House in Omidong” at the time of its designation as important folk cultural heritage but was renamed “Hagam Historic House in Andong” by adopting owner Kim Jung-hyu’s pen-name Hagam and the location of the House in Andong (Dec. 21, 2009). 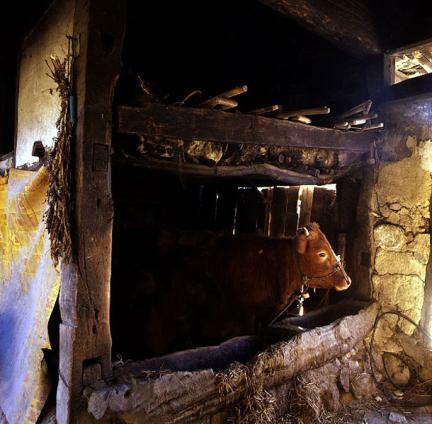 ※ Viewing of the cultural property above is usually available anytime but may be limited depending on the owner’s personal circumstances.